After releases like “1942,” “Drop,” and “Rewind,” Bay Area rapper G-Eazy released a song from his long awaited project Endless Summer 2, a sequel to his 2011 mixtape. “Endless Summer Freestyle” is a collaboration between G-Eazy and rapper YG, which samples the 1956 song “Neki-Hokey” by The Cleftones. The track is a blast from the past with echoes of his older style off of projects such as The Outsider or Must Be Nice. G-Eazy begins the song with what is most likely a message to fans: “If you ask, then you shall receive,” followed by “If you insist, then I’ll oblige.” Whether the first lyrics of the track are a blatant message to longtime fans or just a coincidence, it does line up with the doomed status of Endless Summer 2. In a series of tour videos during the Endless Summer Tour in 2016, snippets of unreleased songs were used as part of the soundtrack. Endless Summer 2, the project that would be the follow-up to the 2015 release of When It’s Dark Out, used samples from multiple classic songs, such as “Smokey Joe’s Cafe” by The Robins. Fans speculated about the status of the album, until G-Eazy confirmed clearing samples of classic songs was much harder than it was in 2011 and the release of the new mixtape was on hold. He credits his lack of fame with being able to get away with using original songs by the likes of The Beach Boys and Dion without having any legal consequences. 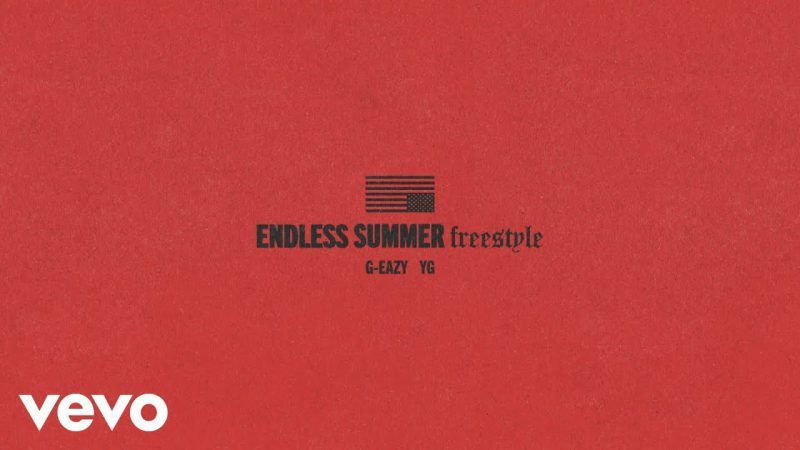 When it comes to “Endless Summer Freestyle” the song brings a refreshing energy to G-Eazy’s recent releases, partly because of the sample that he used. “Neki-Hokey” gives the song a unique and vintage sound, reminiscent of songs “Runaround Sue” and “My Next Fix.” Lyrically, G-Eazy does resort to his rambunctious bragging about his alcohol infused, marijuana fueled lifestyle. Talk of his love to “roll up some gelato and listen to jazz” and how he’s going to “profit off of this jawline” dominate the first part of his verse. Although it is a far leap from where he started with talks of opportunity cost and how long he’s struggled for, G-Eazy does still bring a joyful aura to songs when he brags. The now common reference to Stillhouse Whiskey, a company he partially owns, fits in with the mood of the song. G-Eazy also brags about the success of his last three albums, “These Things Happen, When It’s Dark Out, Beautiful is platinum.” The track takes a turn mid-verse when YG enters. At first he takes the same route as G-Eazy; YG raps about his success, girls and money, but slowly takes a dip into politics. G-Eazy and YG have collaborated on one other political project, “FDT Pt. 2,” a diss track aimed towards then presidential candidate Donald Trump. This time, YG brings up the Black Lives Matter movement and the killings of unarmed black men by white police officers. The lyrics “Life’s a fight, live right fight back but wait, my hands up don’t shoot” show the sad truth that even people are scared to protest because they’re afraid it will come back to hurt them. At the end of his verse, YG calls on G-Eazy “Please tell me how these white folks feel,” the music stops and G-Eazy almost reads off headlines: “Cops killing black kids and get off scot free, what’s the difference, what would happen if a cop shot me? White privilege is real, black lives matter,” and with that, G-Eazy signs off. “Endless Summer Freestyle” is a stunning throwback with a sample that evokes a vintage yet modern feel. The way both G-Eazy and YG work off of each makes the song even better. For longtime fans the song is a blast from the past and a return to simpler times. The message that the rappers bring and the energy behind it gives the song a genuine and raw vibe. Unlike recent releases, “Endless Summer Freestyle” hits hard with meaningful lyrics as well as a unique beat. Have you heard the single yet? What did you think?